The Nest Learning Thermostat is obviously the most popular and well-known smart thermostat out there right now, but it’s hardly the only option. In fact, there are some rival models that cost much less and still manage to offer nifty features you won’t find on the Nest. 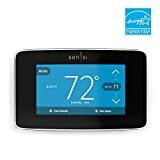 One such example is the Emerson Sensi Touch Wi-Fi Thermostat, which is available right now at a discount on Amazon. It packs all the features you would normally want and even has Alexa support, but it also features a nice big touchscreen, which is something you won’t find on any Nest.